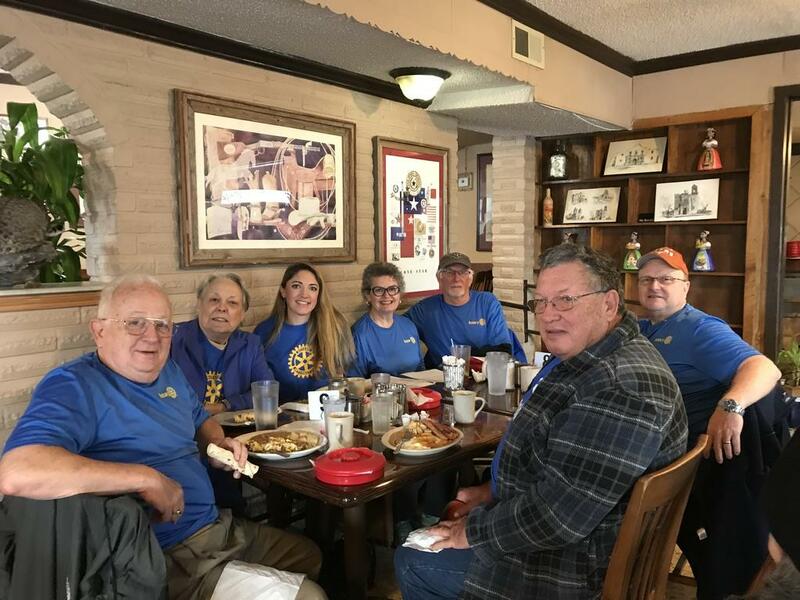 Rotary is a community service group of business people focused on the needs of their community. 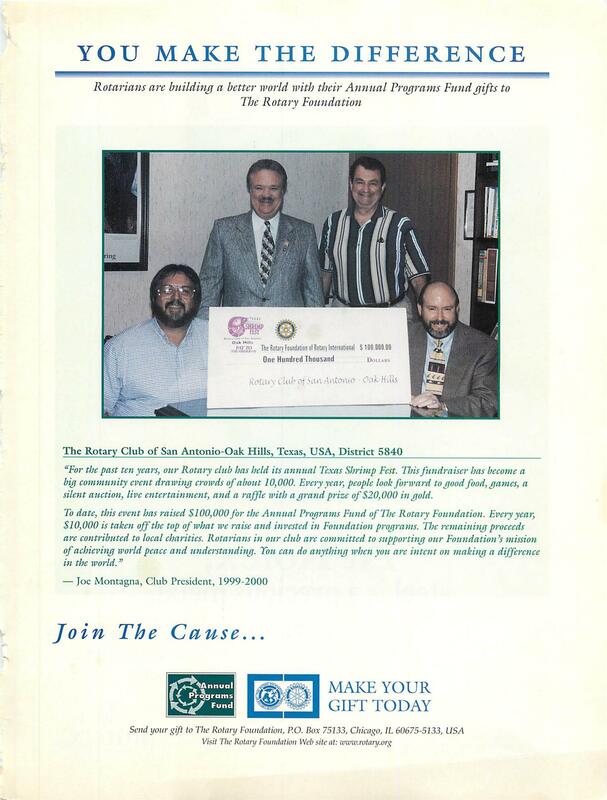 Rotary has been around for well over 100 years, starting in February 1905. The place was Chicago, IL. Paul Harris, an attorney, met with three other local businessmen to discuss improving the business relationships in Chicago. They would “rotate” their periodic meetings between their businesses as they expanded the discussion and brought others businessmen into the meeting. They became organized and incorporated other ideas as they grew. A second club was formed in San Francisco in 1908 with a few more clubs following elsewhere in the United States, one of which was here in San Antonio. In 1911 Rotary became international with the establishment of a club in Canada. 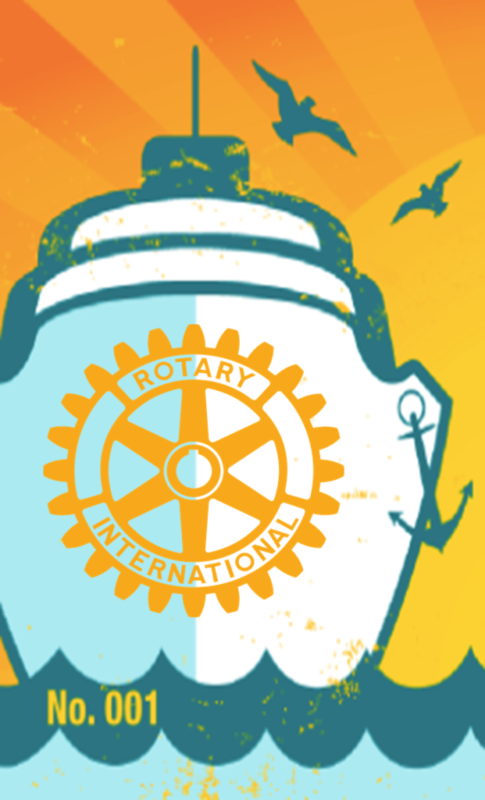 Today there are 1.2 million Rotarians in more than 34,000 clubs in over 165 countries. Each club supports programs in their community, state, nation, and throughout the world. 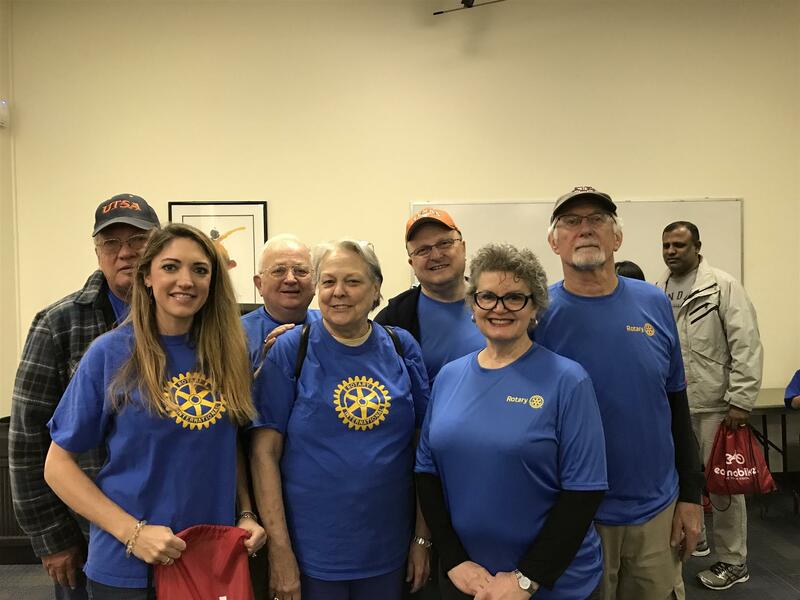 Since 1986, Rotary International has been a major force responsible for the near eradication of Polio worldwide and we have been joined by the Bill & Melinda Gates Foundation and the World Health Organization in this effort over the last several years. 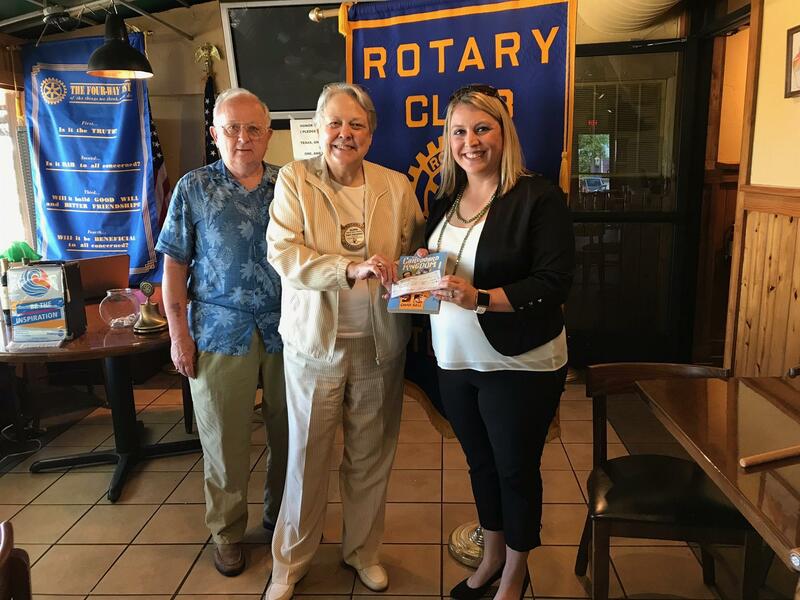 Our Club contributes to the Polio Plus foundation each year. 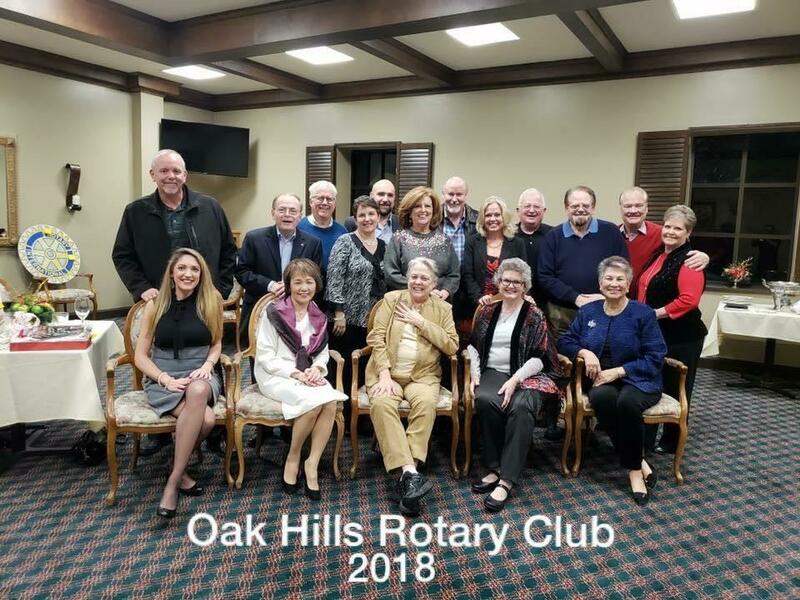 Oak Hills Rotary Club was chartered in October 1977 and we took our name from the original meeting place, the Oak Hills Country Club and have been a community leader in our area from the beginning. Our primary philanthropy is to support Child Hunger Programs, Youth Education Programs, and Regional & International Programs. Please review the Photo Album portion of this Web Page to gain an understanding of our community interface. 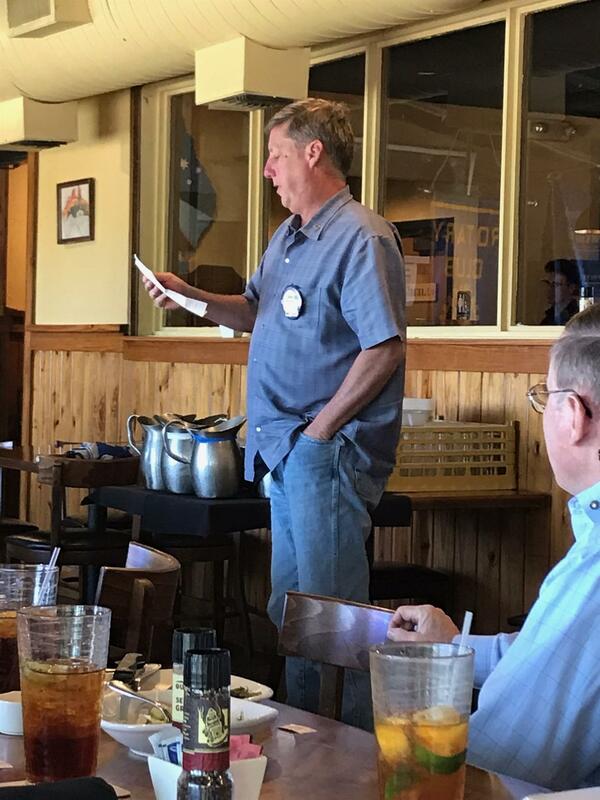 Oak Hills Rotary Club meets most Wednesdays at noon for an hour of fellowship and fun. We take the work we do seriously but not ourselves. Come have lunch with us and learn how you can support the San Antonio and International Community. 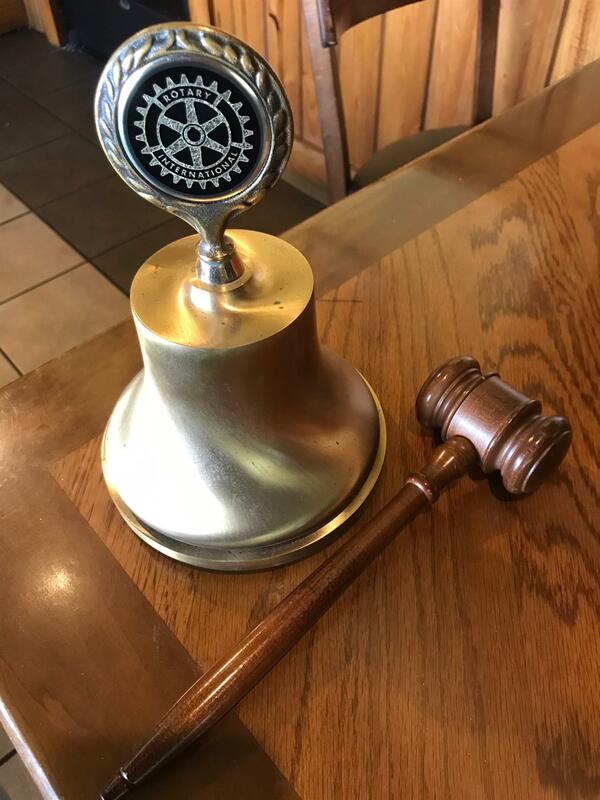 The meeting began with the ringing of the bell by Past President Bruce Richter. Ken Donoughue led us in a word of prayer and the pledge. Gloria Richter introduced our guest today: Janet Pedrotti of the Girl Scouts of Southwest Texas. 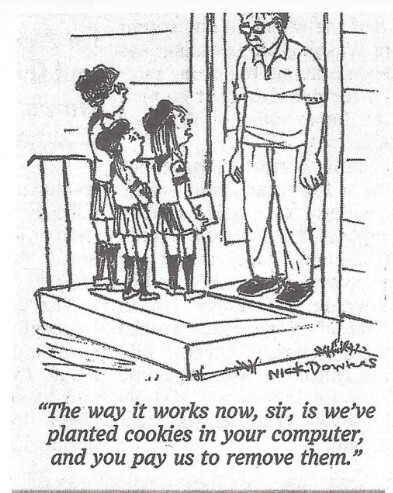 Gloria shared with us that when she was a Girl Scout the cookies were only 50 cents! Bruce reminded us to finish selling tickets for the cruise raffle tickets. Drawing is May 4. He was also especially happy to announce that the true Happy Hour is Thursday April 18!!!! at the Outback Steakhouse around 6:30 pm. Ken Donoughue shared the sad news that Chuck Steinmetz passed away - more info to come. 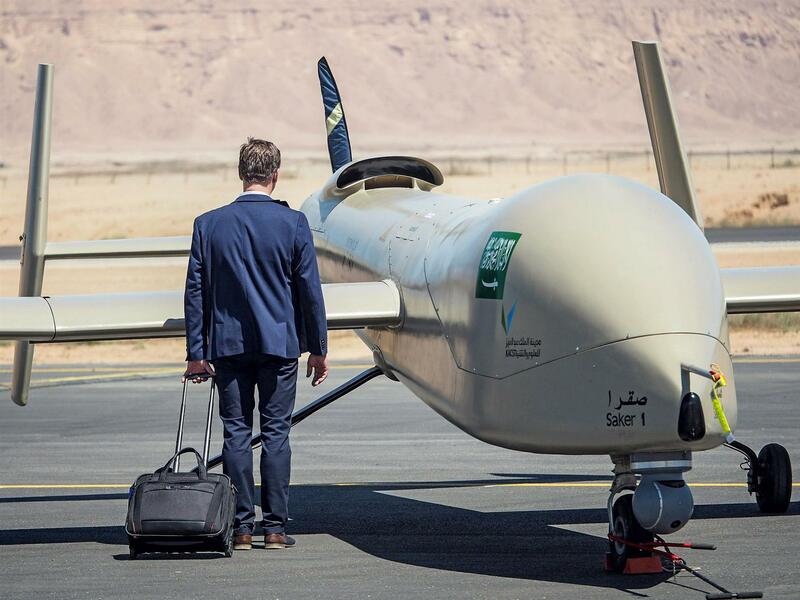 Chuck is the brother of club member George Steinmetz. The news is full of alarming problems with the Boeing 737 Max. As an alternative, Southwest Airlines is introducing predator fares: a no frills flight on a drone and it offers no alcohol, a pair of goggles and a mouth piece. Bug removal for people who smile a lot. 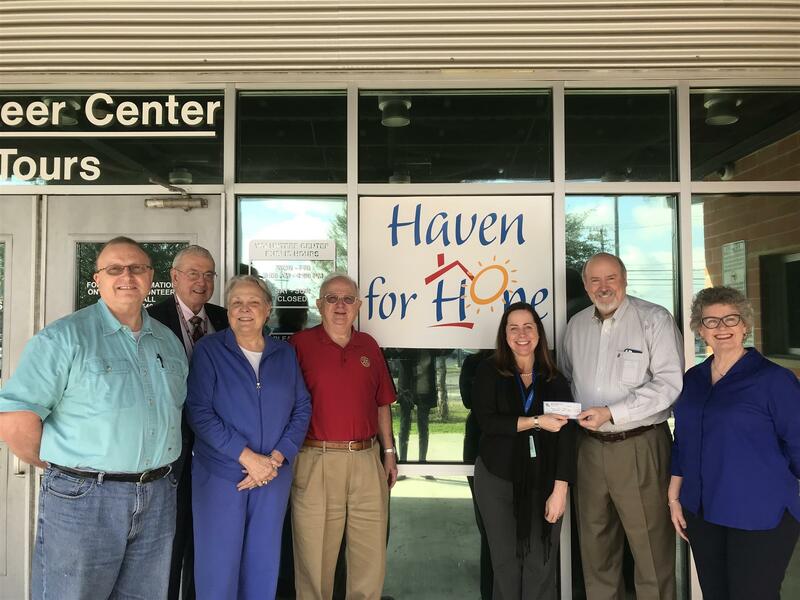 Janet Pedrotti has been with the Girl Scouts of Southwest Texas for four years serving as their Director of Development, handling all fundraising activities for the council. 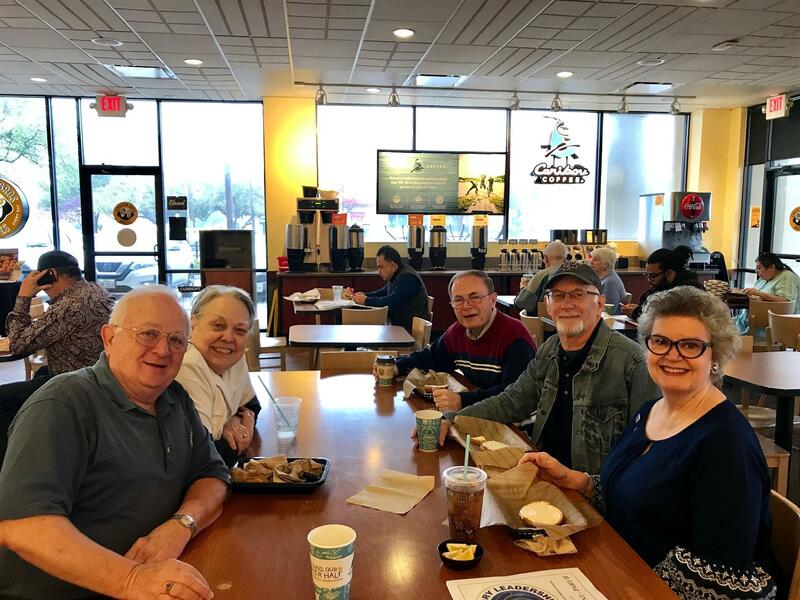 Janet shared with us about Camp Metro and Camp La Jita and shared the 2019 Camp Guide. The Guide will be available at our hospitality table at our next meeting in case you missed it! Camp Metro is broken into 8 individual weeks of summer camp fun. Groups are split into appropriate age groups. There are hands-on projects and at the end of the week there is a field trip and they try to pair the field trip with the theme. The girls have the opportunity to earn patches. Good news: girls don't need to be a Girl Scout to come - this is open to all girls! To assist working parents the program offers before and after camp care and transportation to the Girl Scouts Headquarters. The camps are some of the lowest cost in San Antonio - a quality program at an affordable cost. Interestingly, S.T.E.M. : science, technology, engineering & math are worked in every single program. The emphasis is on fun & learning - keeping them engaged during the summer. Girls are surveyed at the beginning and at the end of camp to see how they've grown. Janet reports that Vulcan Materials is the most popular field trip! Tuition is $175 per week and there is tuition assistance available. Our Club donations help with tuition assistance so that no girl is turned away. 1. "Life isn't about finding yourself. Life is about creating yourself." 2. "I'm not afraid of storms, for I'm learning to sail my ship." 3. "Everything you can imagine is real." 4. "If you're going through hell keep going." 5. "Well done is better than well said." 6. "Laughter is an instant vacation." Derek remains fine free during the time he owns the umbrella! 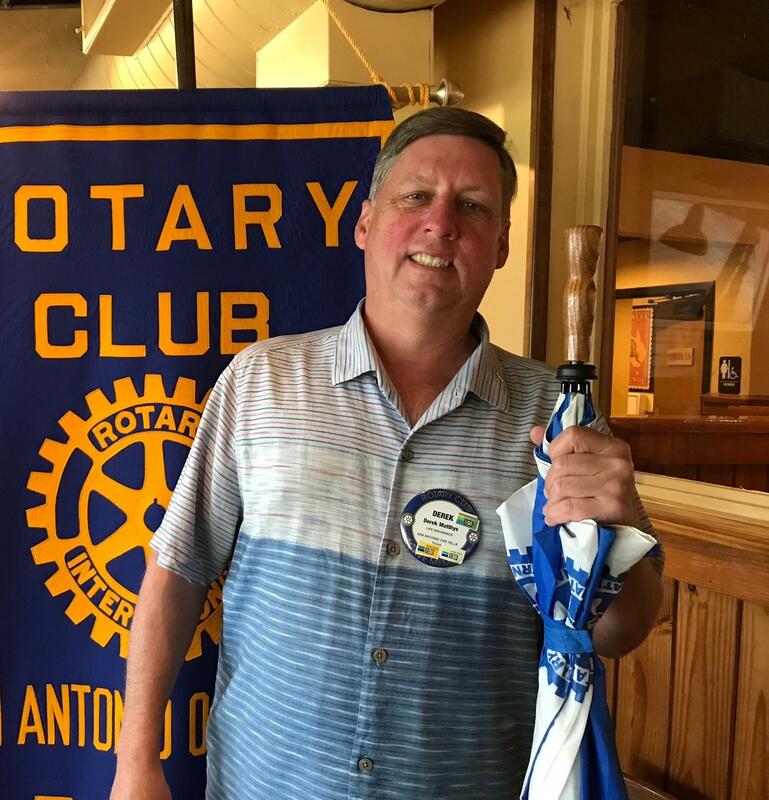 Ken shared with us that NISD Storyfest 2019 will be on May 18 from Noon til 3 p.m. at Pat Neff Middle School, 5227 Evers Rd. 78238. It promises to be a day of fun activities including a visit from author Jonathan Auxier as well as some local authors! Thank you Ken for sharing these great ways to give back to the community while helping children learn to love to read! Roger Thompson confessed that after eye surgery he now has holes in his vision. He worked in the yard pulling weeds and his wife Peggy pointed out that me missed some. Roger replied, "I pulled every one that I saw." Destiny Mujica confessed that she celebrated another birthday. She made a contribution to her Paul Harris Fellowship. Veronica Felan confessed that she is engaged to be married and the happy couple is planning to wed May 11. 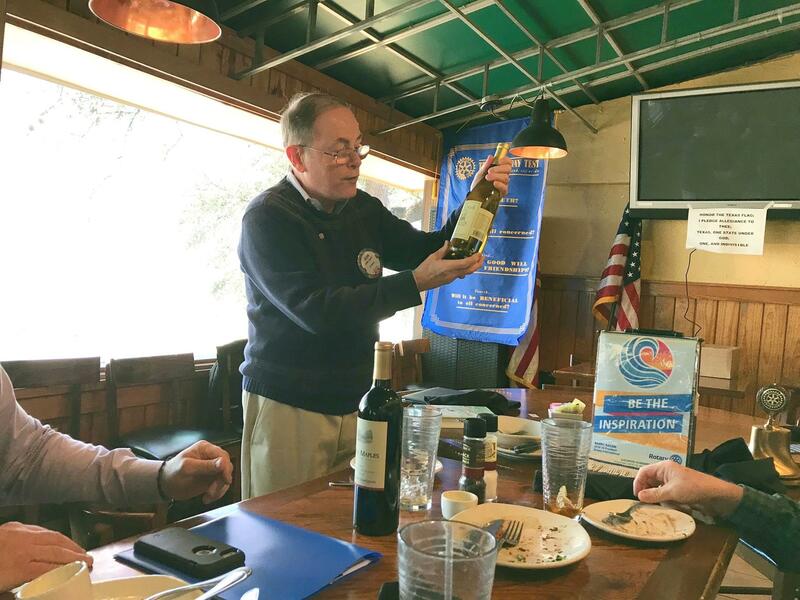 John Legris continues to educate us on the finer points of wonderful wine! Thank you John for imparting your knowledge so we will now know how to pair wine with our food. Bruce now introduces him as "our Sommelier!" Derek Matthys won the opportunity to draw the 2 of Clubs to win the $350 pot. He drew the 8 of diamonds. Barry Abrams owned the second ticket drawn. Both took home bottles of wine but since the club secretary and treasurer were talking in the back about important club stuff and not paying attention she doesn't know who chose what. 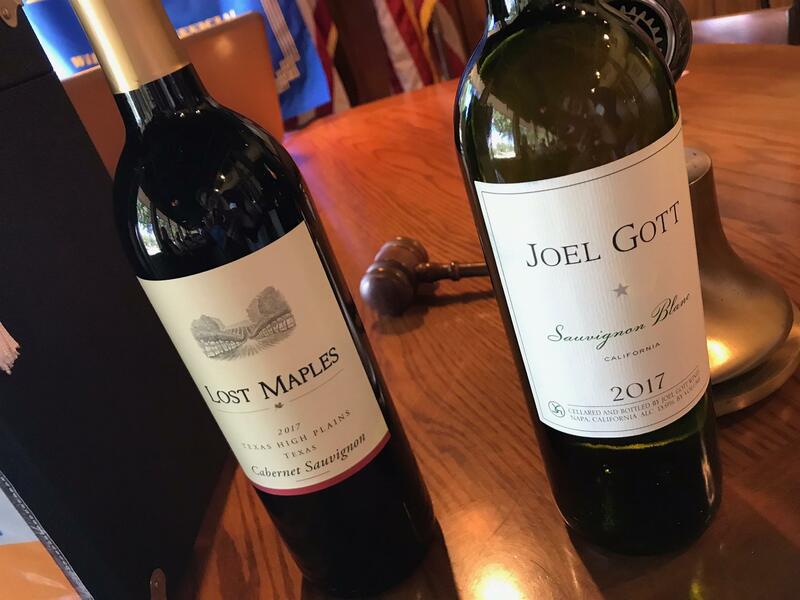 Thank you Derek Matthys for supplying the wine this month! 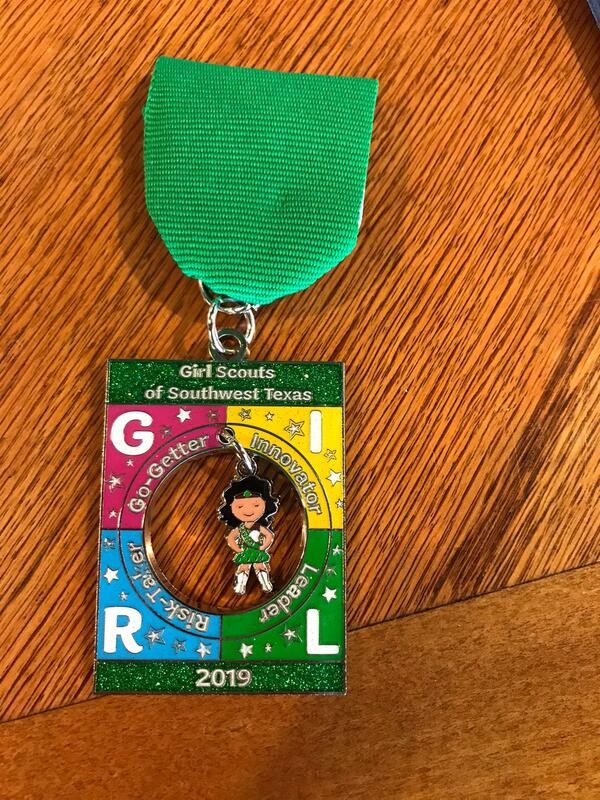 Today our speaker Janet Pedrotti generously donated Girl Scout Cookies and two Girl Scout Fiesta Medals to be raffled! Come for the coffee and treats and stay for the riveting conversation and camaraderie! Typically the second Friday of the month. 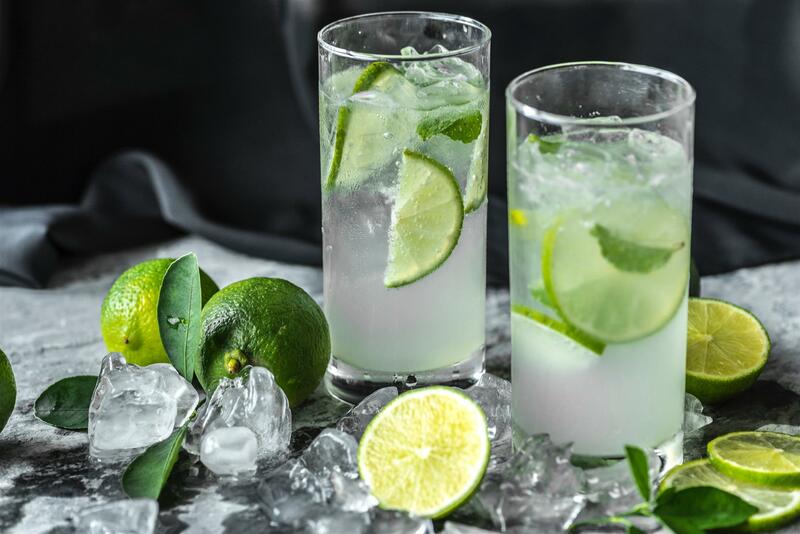 The Outback Steakhouse is the new place for libations and munchies - typically the third Thursday of the month. Come join your friends and unwind on April 18! Bruce reminded us to continue selling the last of your tickets for the cruise raffle! Drawing is May 4. Did you know that there's a full calendar of events in District 5840? 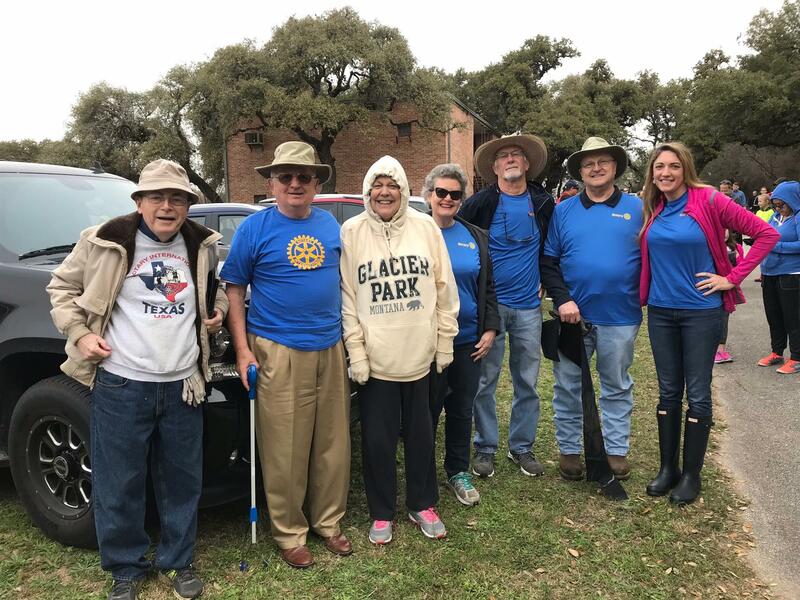 Being an active Rotarian is never boring! Don't miss out! For more information on these and tons of other events going on in District 5840, visit the official website HERE! 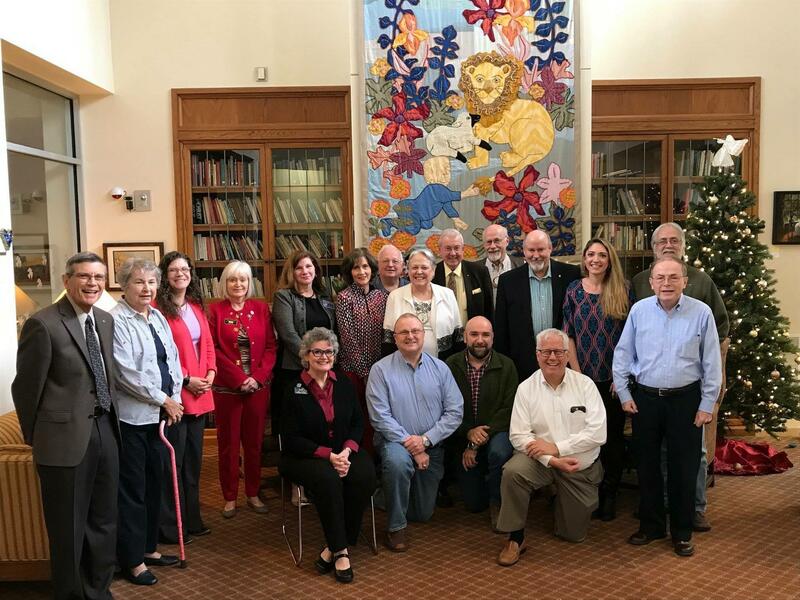 May 18 Rotary Leadership Institute - registration is now open! Bil Trodlier closed the meeting with the Four Way Test. 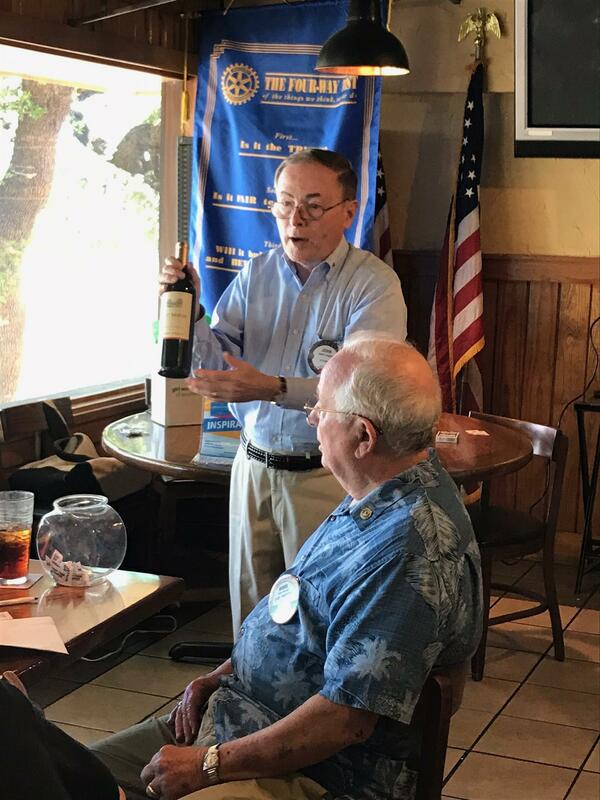 "Bring someone to Rotary Bring a friend to rotary. we all need to eat lunch, why not enjoy it with Rotarians and learn something interesting during one of our programs." JOIN US AT OUR NEXT MEETING-VISITORS WELCOMED!